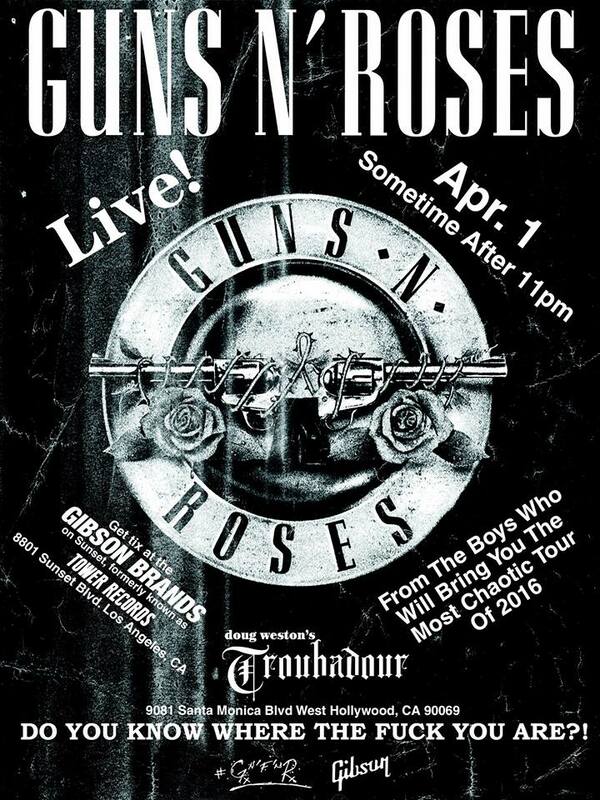 A reunited Guns N’ Roses will perform a rare intimate show at The Troubadour in Los Angeles tonight. Tickets are $10 , limited to 1 per person and will be available at Gibson Brands at 8801 Sunset Blvd in West Hollywood at NOON local time. Purchasers will receive a non-transferable wrist band at point of sale; no cameras will be allowed inside the venue. While in the queue, fans are invited to start the celebratory day with a trip down memory lane in the venue where guitarist Slash used to work, as the old Tower store has been transformed into a complete interactive GN'R experience with a memorabilia exhibit curated by Blaine Halvorson, designer of MadeWorn. The exhibit opens at 12 p.m. and will include historic items such as members’ classic attire, original artwork, personal awards and more. The Troubadour show comes exactly one week before the reunited band launch their 2016 tour at the new T-Mobile Arena in Las Vegas, NV on April 8 & 9. 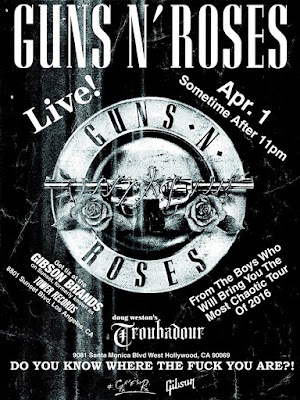 Friday’s club show will reveal the lineup for the run, which currently has only officially announced the involvement of Axl Rose, Slash and Duff McKagan.